Wilbur is a happy, affectionate Golden Retriever mix who never walks anywhere, he trots. His favorite activities include running with mom at the track, taking a sniffing adventure with his sister Pork Chop, and keeping an eye peeled for the neighborhood cat. Wilbur is now living his best life thanks to the skilled doctors and staff at the Lois Bates Acheson Veterinary Teaching Hospital. When Wilbur was just a puppy, he was diagnosed with an abnormal growth of cartilage in his shoulder, and referred to OSU for surgery. Dr. Jennifer Warnock, a professor and orthopedic surgeon, successfully removed the diseased cartilage and Wilbur’s shoulder got better. 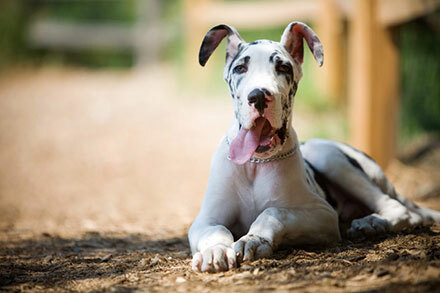 At the same time, Dr. Warnock discovered that Wilbur had hip dysplasia, a joint deformity common in some dog breeds. She recommended non-invasive treatments to strengthen his hips and minimize pain. Over the next eight years, Wilbur’s mom, Debbie Franke, took good care of him, including regular physical therapy, and anti-inflammatory drugs, but eventually his hip dysplasia got worse. “His trot was painful, more like a bunny hop,” says Franke. This summer, she brought Wilbur back to OSU for a total replacement of his right hip. Suitcase recovery station in the free clinic in Falconiana, Costa Rica. When protests against the Ortega dictatorship in Nicaragua turned violent in April, OSU members of the International Veterinary Student Association met with Dean Tornquist to discuss whether to go forward with the annual service trip to Nicaragua. 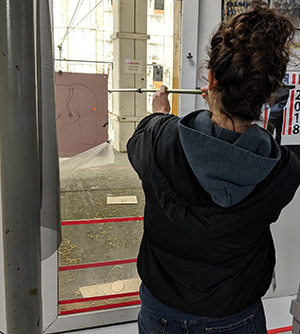 The group decided it was not safe and, with much regret, the trip was cancelled; but veterinary students would not be where they are without grit and determination, and Kelly Riper (Class of 2020) decided not to give up yet. 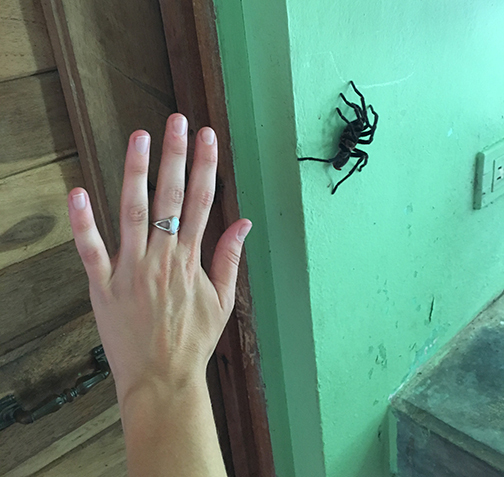 She enlisted the help of Assistant Professor Brianna Beechler to try to find an alternate location. Eventually Riper managed to round up seventeen OSU veterinary students, a large animal surgeon, three students from Tuskegee University, and two Oregon veterinarians. It was just barely enough to staff a clinic. 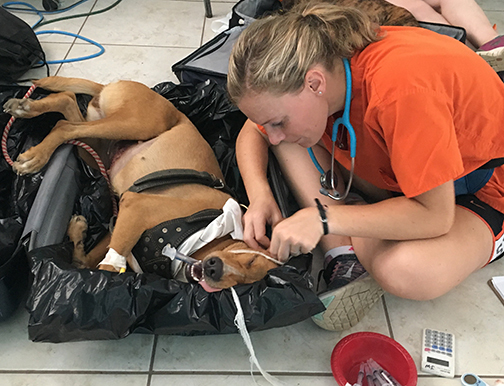 For ten years, the OSU College of Veterinary Medicine has been holding free clinics in the same location in Nicaragua, so they had a well-defined plan for logistics, and a book of instructions for the next year’s group of volunteers. This time Riper and her team were flying blind. And you thought your college roommate was bad. Tazz is a red kangaroo who lives with his family of dogs, people and two other kangaroos. 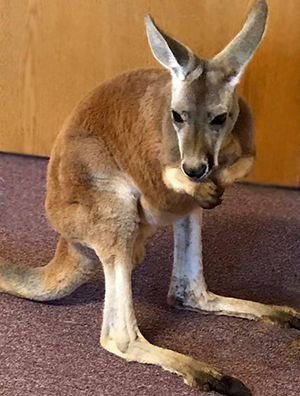 He was bought at an auction in Missouri by Christine Dobratz when he was seven months old, and although he is now four feet tall, he is a lap roo at heart. He and his kangaroo pals, Buddy and Cricket, are gentle and friendly, and like visit elementary schools where they get lots of attention. The three kangaroos enter their house by hopping up a ramp. In September Tazz somehow got stuck under the ramp and could not get out. When Dobratz found and released him, his back leg was obviously dislocated and he could not hop. She rushed him to a local veterinarian, where x-rays established that there were no long bone fractures, so the vet stabilized the leg with a wrap. When Tazz did not improve, Christine contacted Dr. Mike Huber, a large animal surgeon at the OSU Veterinary Teaching Hospital. He agreed to see Tazz and offer some treatment options, so Christine drove all the way from Kelso, Washington to Corvallis for a consultation. Dr. Huber ordered a CT scan which revealed small fractures near the ankle joint, torn ligaments, and a dislocated foot. He consulted with two orthopedic surgeons in the OSU small animal hospital, Dr. Jeffrey Biskup and Dr. Jennifer Warnock, both of whom repair bones in dogs and cats many times a week, but had never worked on a kangaroo. The three surgeons did a lot of research, and after much discussion of options, came up with a plan: attaching an external fixator plate for initial stability of the ankle joint, and insertion of pinned crossbars between the shin bone and foot. Christine supported the plan. “I felt so relieved with three doctors involved in his care, and knowing they were the best I could get,” she said. Once he was out of surgery, Dr. Huber designed and built a custom-made bandage cast. “One of the biggest challenges was keeping him quiet, and preventing him from using his very dexterous hands to destroy the bandage,” he says. Osteosarcoma is typically a very aggressive bone cancer that starts in a leg bone and quickly spreads to the lungs. Early detection and treatment can add years to a pet’s life. Canine osteosarcoma is the most commonly diagnosed bone cancer, and is often very aggressive in spreading to the lungs and other areas. Once the tumor metastasizes, dogs only live, on average, a couple of months, even with chemotherapy. The best case scenario for saving a pet with osteosarcoma is to catch it early, before it spreads, and remove the tumor. This can add years to a dog’s life. The current method of diagnosing canine osteosarcoma is done with a CT scan, followed by a biopsy to determine if the tumor is benign or malignant, a procedure that is invasive and costly. 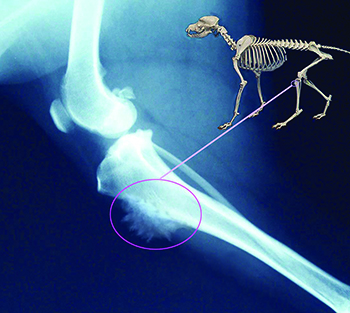 Dr. Shay Bracha, a canine oncologist at the OSU Veterinary Teaching Hospital (VTH), is working on a less invasive, more effective screening for osteosarcoma. Cancer spreads by compromising the immune system. Dr. Bracha’s research team has been investigating the role of exosomes in immunosuppression. Exosomes are tiny structures made in the body’s cells that are thought to be involved in signaling between cells. The Bracha team exposed healthy T-cells to exosomes from malignant cancer cells and examined the impact. They found that malignant exosomes negatively inhibited the function of healthy cells, and caused early die-off and reduced normal cell increase. Most importantly, the study also found that malignant exosomes, compared to healthy cell exosomes, have a high concentration of unique proteins. This opened the door for Bracha to develop a potential diagnostic tool. His team is now focused on using malignant exosomes as a biological marker to screen for canine osteosarcoma with a simple blood test. The hope is that this could lead to routine screening by primary care veterinarians that would reveal the presence of osteosarcoma early enough to remove the tumor before it spreads. The oncology service at the VTH is a member of the Comparative Oncology Trials Consortium which is organized by the National Cancer Institute. This allows pet owners the option of choosing cutting-edge treatment while helping to gather important data on cancer treatment that may benefit both animals and human. The VTH oncology service is currently enrolling patients in six clinical trials. The hospital also enrolls pets in clinical trials in cardiology, radiology, and other areas of veterinary medicine. To learn more, visit vetmed.oregonstate.edu/clinical-trials. Joan and Terry Ferguson have a small desk in the waiting room of the Small Animal Hospital at OSU, but they don’t spend much time sitting there. Terry can often be found out in the parking lot, rain or shine, handing out parking passes and helping clients unload a sick pet. Joan dispenses dog biscuits and tips on where to eat, but more importantly, spends a lot of time sitting with clients, providing company during a long wait, or listening with a sympathetic ear; that is especially helpful when a pet is seriously ill or injured and a client is upset. The Fergusons drive for more than an hour every week to volunteer at the hospital. 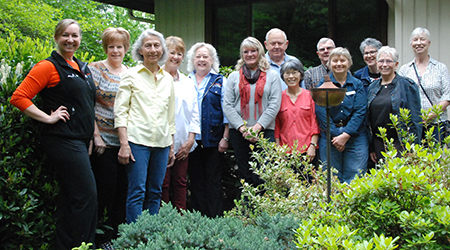 “We are so lucky to have them,” says Client Advocate, Tammy Barr, who supervises seven hospital volunteers and manages the Grateful Client Program. The program was organized after many former clients expressed a desire to give back in return for the excellent care their pet received at the hospital. Former clients contribute in many ways to the success of the hospital, from buying pizza for the students working overnight in the large animal hospital, to sewing blankets for ICU, to purchasing a much-needed piece of equipment, but the hospital volunteers form the heart of the program. The Client Advocate position and the Grateful Client Program have been so successful at OSU, other colleges have contacted Barr about duplicating it in their hospitals, and the OSU Large Animal Hospital recently added a Client Advocate as well. Grateful clients, Caroline Ajootian and Joan Campf, support both positions. “Janet and I receive satisfaction in trying to make the hospital visit, for both animals and their caregivers, as easy as possible,” says Dave Perry. Osband met Hank when he was just five weeks old and fell in love with him. Soon after, he was diagnosed with a Grade 4 heart murmur, a sign of congenital heart disease. Osband decided to adopt him anyway. 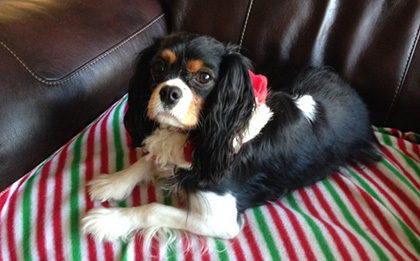 As a new resident of Oregon, Osband hunted for a veterinarian who could treat Hank’s condition. 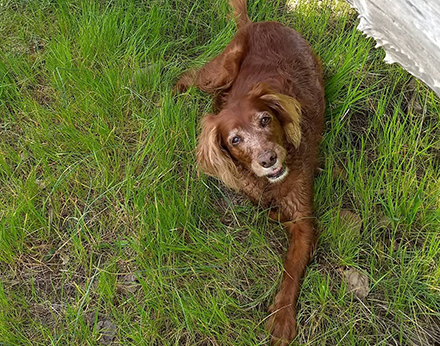 Several told her to wait and see if he survived six months, but Dr. Ashley Robinson, at VCA in Eugene, did an ultrasound of his heart, found a valve defect and referred Osband to the Cardiology Service at OSU Veterinary Teaching Hospital. 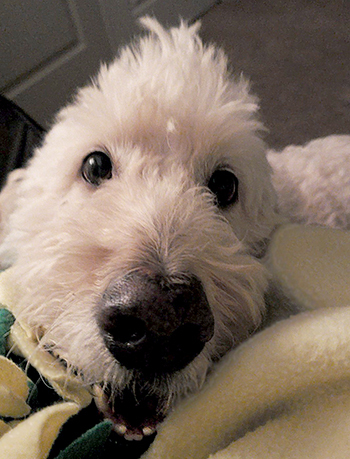 At OSU, veterinary cardiologist Dr. Kate Scollon diagnosed Hank’s problem as pulmonic stenosis, a condition where the heart valve is thickened or partially fused together, obstructing blood flow from the heart to the lungs. She sees many dogs with this condition and was confident she could help Hank, but he needed one more month to get bigger. In February 2017, the OSU cardiology team performed a balloon valvuloplasty, where a special catheter was inserted into the defective valve in Hank’s heart and a balloon was inflated, enlarging the restricted space. “The results were positive almost immediately after the surgery, including a greatly reduced heart murmur,” says Osband. It was a terrific Valentine present. 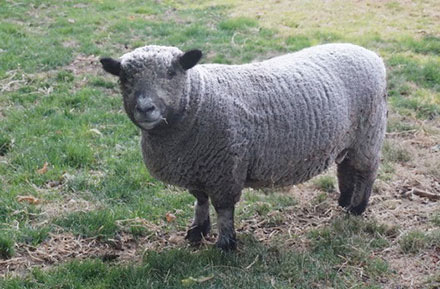 Generally speaking, sheep do not make great pets. They tend to be afraid of humans and have a strong flock instinct so you have to keep several together. There are exceptions; some breeds, when bottle fed by a human from the time they are babies, come to think of themselves as small, wooly people. One example is a miniature breed know as a Babydoll. Last fall Jack became very ill and died of copper poisoning. Sheep owners beware: Copper is very toxic to sheep and can be found in some animal feeds. Also, the symptoms of copper poisoning often don’t appear until the sheep is already very sick. At OSU, Dr. John Schlipf and Dr. Sarah Schale ran tests and found Miles to have increased pulse and respiratory rates, decreased red blood cell count, and blood analyses consistent with kidney damage: all signs of copper poisoning. They treated him with intravenous fluids, but when his anemia and kidney tests worsened, they gave him a whole blood transfusion. They also put him on diuretics to increase blood flow to the kidneys and increase urine production to flush out the copper and broken down red blood cells. When Miles was still not eating, Clementine, a cow in the OSU teaching herd, stepped up to help. She is a fistulated cow who has a portal in her side to access her rumen (the largest of her four stomachs). Through this portal, the doctors obtained rumen fluid and fed it to Miles. Rumen fluid is full of beneficial microbes and nutrients that are good for sick animals. In the past, Clementine has donated to goats and other cows also. After several days of intensive treatment, Miles’ kidneys improved and he began eating normally. He is still anemic but that should improve with time. He may have some permanent kidney damage but is back home and doing fine. The long stay in the hospital with lots of TLC from students, technicians and doctors gave Miles a taste for attention. “He stays on the back deck and gazes through the sliding doors,” says deCarlo.